(SPOT.ph) If you didn’t already know, here at SPOT.ph, we love food. You need it to live, but we find that there are some dishes that go well past the virtue of necessity. While others content themselves with a deep fryer and the usual salt and pepper, there are some who make—or at least try to make—an art out of it, with delicious displays and even yummier flavors. We believe those that go above and beyond their duty deserve necessary recognition. 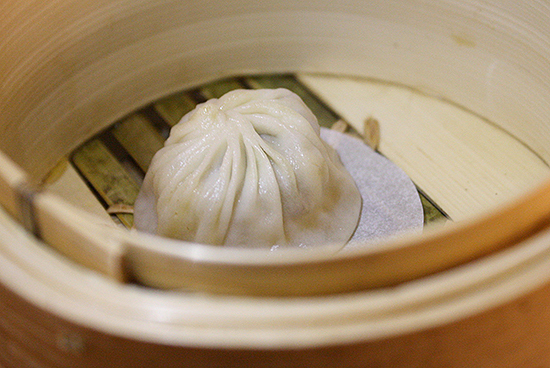 So here are our top picks among the dishes we ate throughout November. This little cake. This glorious little cake. It's bigger than your average miniature but smaller than your average coffee-shop cake. The size, however, doesn't matter. 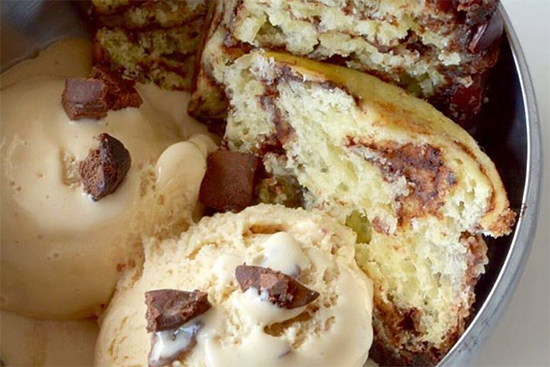 You're going to want seconds, maybe thirds. Topped with sweet mangoes, it's playfully swiped with a subtly sweet white cream speckled with bits of mango. To say that this cake is creamy is an understatement: inside, layers of yellow cake alternate with thicker layers of cream. The coconut shows up as you enjoy every forkful—delicious nutty chunks, bursting with the flavor of the tropics with every heavenly bite. Click here for a list of UCC branches. 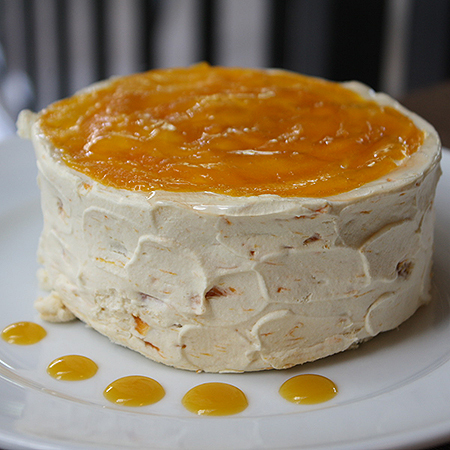 Read more about UCC's new Coco Mango Cake. Make no mistake: The wings are delicious. They're fleshy and bony in all the right ways, coated with a sweetish spicy sauce we've come to love from Korean fried chicken. It is, however, the waffles that captivated our taste buds. They're perfect grids, crunchy on the outside with a downy interior. 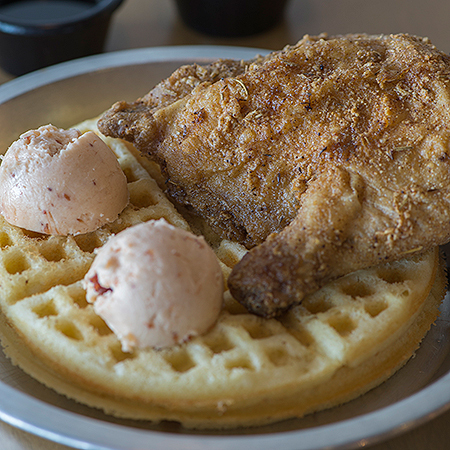 We love how the savory profile complements the chicken. No Reservations loads theirs up with a bold touch of spring onion! No Reservations is at Unit 16, United Street, Kapitolyo, Pasig City. Read more about No Reservations. There's a simple reason why we love Stephen's Brick-Oven Pizza. 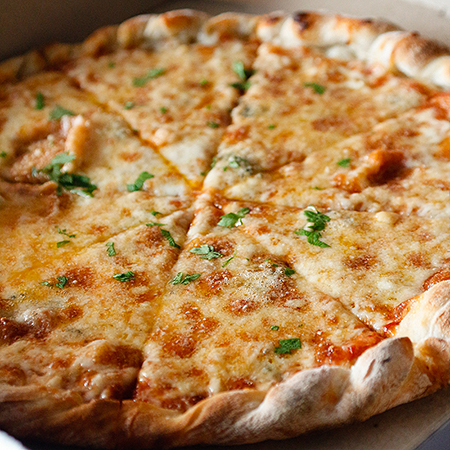 Stephen Chanco piles on at least three cheeses on each, and it's a splendid combination of mozzarella, fontina, and Parmesan. This is the premise of his most basic Three Cheese pie, but we love how he amplifies that goodness further by adding gooey Blue Cheese to the mix. That's a cheesy punch! For their first anniversary, Linguini Fini has relaunched their full menu—a total of 22 pasta dishes. 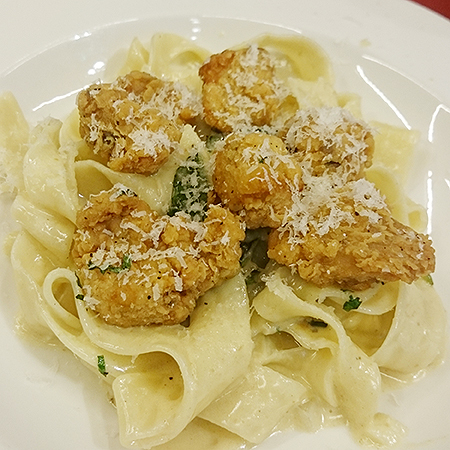 It's difficult to pick a favorite, but the simple comfort of the Fried Chicken Alfredo won us over. The fried chicken is tasty on its own, coated in a perfect batter with the right amount of salty seasoning (we can totally enjoy it on its own). Its unabashed flavors work well with the pasta cream, which is subtle without being neither underwhelming nor cloying. Linguini Fini is at SM Mega Fashion Hall, Mandaluyong City. Read more about the Fried Chicken Alfredo. 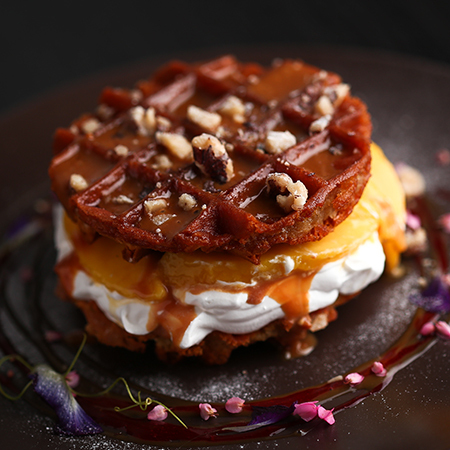 The waffles sandwiching the cream are so thin, they remind us of stroopwafels. The waffles are fried crispy to develop a nice juxtapostion against all that filling. 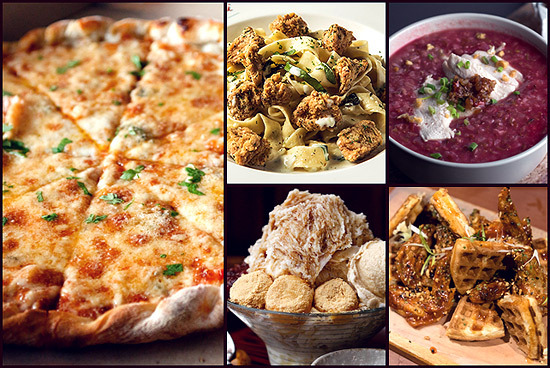 We love how they draw people in by using people-pleasing flavors and combinations. The tropical sweetness of the mango works so well against salted caramel. Milkbox is at New Wing, Alabang Town Center, Muntinlupa City. Read more about Milkbox. 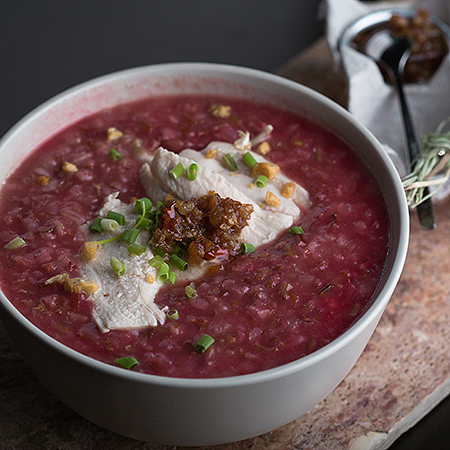 When owner Sean Go told us about his pink arroz caldo, we were somewhat skeptical. Could this be a gimmick to attract Instagram hounds and their double-tapping followers? The big bowl of periwinkle rice is indeed gorgeous, but it's the flavors that really took our breath away. It's more pronounced, chunky but soft, and tangier than most (but we can't get enough of the lime so go on and squeeze away). We love the whisper of heat that chases after your palate just when you think you've tasted everything. The pink comes from beets, but it doesn't interfere with the profile at all. Adaam & Yves is at Icon Plaza, 25th Street corner 6th Avenue, Bonifacio Global City. Read more about Adaam & Yves. We appreciate restaurants that make things from scratch—and give us a healthier way to indulge. Ikigai Kakigori preps everything, from the brownies to the ice cream to the milk ice to the rice balls. 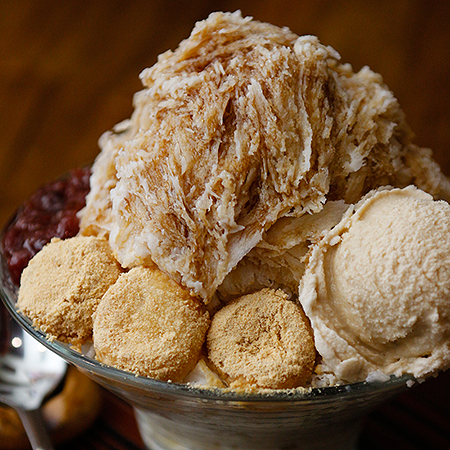 The Kuromitsu is a Japanese classic: a smorgasbord of milk ice drizzled in brown sugar syrup (a lighter version to our arnibal), crowned with houjicha and smoked green tea ice cream, sweetened adzuki, and a special shiratama flour. Ikigai Kakigori is at POS Building, Scout Mandrinan corner Tomas Morato Avenue, South Triangle, Quezon City. Read more about Ikigai Kakigori. November has been a good moment for waffles. Unlike Milkbox and No Reservations which churned out quirkier interpretations, this hipster cafe in Teachers Village surprisingly goes for a straightforward approach. Tell the server to cook these golden discs well-done to get that nice crunch; a happy little touch is the strawberry butter than comes with it. 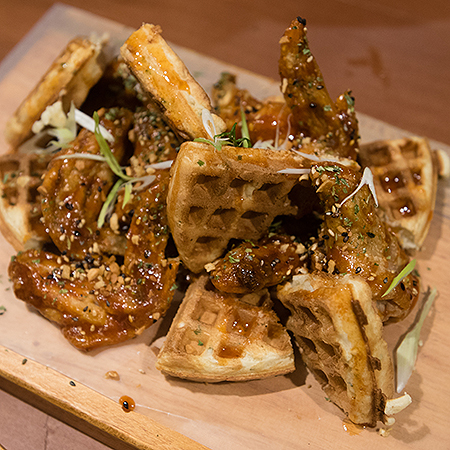 The chicken pieces are crispy, bolstered by a spicy-sweet maple syrup! Fans of Wagyu steak would immediately fall head over heels in love with Buta + Wagyu, the "restaurant" arm of acclaimed meatshop, Wagyu Japanese Beef at Sunvar Plaza. Here's where you truly enjoy that intense marbling. The chateaubriand is the most tender cut of the cow, as well as its beefiest part. If you're not particularly enamored by the fat-heavy rewards of Wagyu, then you'll love the brawny flavor that makes itself known amid all those wonderful buttery notes. Buta + Wagyu is at SM Aura Premier, Bonifacio Global City. 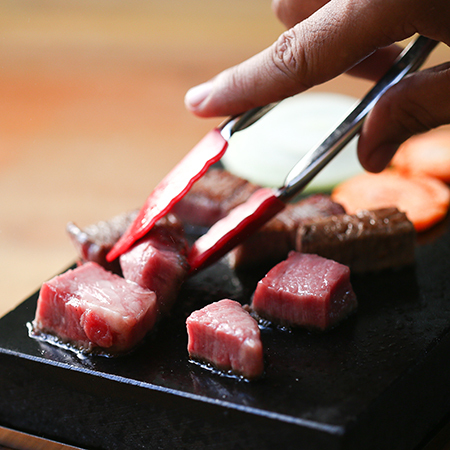 Read more about Buta + Wagyu. Have you ever wondered what could make the French toast in front of you better? Refinery pretty much solved that quandary. Bacon, obviously. 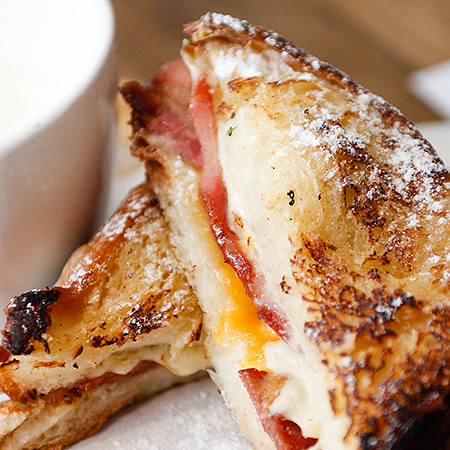 A battered and buttered brioche is stuffed with melted mozzarella and cheddar, the maple smoked bacon cutting through the saltiness and giving it bite. The sweetness is very mellow, slightly from the bacon, slightly from the powdered sugar. It comes with ice cream, too! Refinery is at Joya Lofts and Towers, Joya Drive, Rockwell, Makati City. Read more about Refinery's new Bacon French Toast. What the heck is a Bibimbun?